Dinariyev, O. Yu. A hydrodynamic description of a multicomponent multiphase mixture in narrow pores and thin layers // J. Appl. Mechs, Vol. 59 No.5, pp. 745-752, 1995. A hydrodynamic model of the isothermal processes in a multicomponent viscous mixture which interacts with fixed surfaces is constructed. In the steady case, the model reduces to a description using the Landau-de Gennes functional. Typical solutions of the equations for a mixture close to a surface or when there are phase transitions are analysed. Classical surface and capillary phenomena are matched with these solutions. Hence, the proposed model enables time-dependent viscous flows of a liquid and a gas in narrow pores and well-known static surface effects to be described simultaneously, namely, the anomalous properties of thin films and surface layers, and capillary condensation and wettability, which is one of the problems in the modern theory of capillary phenomena. Dinariyev, O. Yu. The description of a multicomponent mixture by the density functional method when there are surface phases present // J. Appl. Mechs, Vol. 65 No.3, pp. 471-478, 2001. The description of multicomponent mixtures, with an expression for the free energy or the entropy in the form of a density functional [1, 2], is extended to the case when the system contains surface phases, when the finite number of particles of the mixture can be linked with certain geometrical surfaces. Equations are obtained which define the static state and hydrodynamic flows for a mixture with an arbitrary number of volume and surface phases. Dinariyev, O. Yu. Thermal effects in the description of a multicomponent mixture using the density functional method // J. Appl. Mechs, Vol. 62 No.3, pp. 397-405, 1998. The use of a model, based on an expression for the total entropy in the form of a functional with the temperature and density gradients of the components, is proposed to describe a multicomponent, multiphase system using continuous hydrodynamics (that is, within the framework of the approach of the continuum mechanics without discontinuities in the hydrodynamic quantities). It is proved that this model is consistent with the zeroth law of thermodynamics. Expressions for the stress tensor, the diffusion fluxes and the heat flux are found from the condition that the entropy production is non-negative. Compared with the classical Newton, Fick and Fourier laws, these expressions contain third-order spatial derivatives. The problem of a mixture between two parallel and impermeable walls at different temperatures is analysed. In this case, the system of dynamic equations reduces to a system of ordinary differential equations. It is shown that the number of free parameters, on which the solution depends, corresponds to the number of boundary and general integral conditions. The relationship between a description of a multicomponent mixture based on the entropy functional with the terms quadratic in the density gradients of components and in the temperature on the one hand, and a description within the framework of classical and quantum statistical mechanics on the other hand, is investigated. Explicit expressions for the entropy functional are written in the context of classical and quantum theories. A quadratic approximation is then calculated for the case of small perturbations of a uniform state. The terms quadratic in the gradients are separated in this approximation. This allows ab initio calculations of the corresponding phenomenological coefficients to be done. Within the framework of the density-functional method, the hydrodynamics of a multicomponent mixture in the presence of a mobile surface phase is investigated. A system of interrelated three- and two-dimensional hydrodynamic equations for isothermal volume and surface flows is formulated. For flow in a thin axisymmetric capillary, the principal term of the asymptotic expansion of the solution in powers of the characteristic capillary radius to length ratio is obtained. For slow motion, the solution is found in quadratures. Numerical examples of application of the density functional used to describe isothermal flows of two-phase two-species mixtures are given. The following flows are calculated in a two-dimensional formulation: impact of a drop on a liquid layer, breakdown of a drop in the velocity field of the Couette flow, formation of the wetting angle of a drop on a solid surface, and development of the Rayleigh�Taylor and Kelvin�Helmholtz instabilities at the gas�liquid interface. A.Yu.Demyanov, O.Yu.Dinariev, Modeling of multicomponent multiphase mixture flows on the basis of the density-functional method // Fluid Dynamics, Vol.39, Issue 6, 2004, pp. 933-944. Examples of numerical calculations of isothermal flows of two-phase two-component mixtures based on the density-functional method are presented. Using this method, the following problems are calculated in the two-dimensional formulation: drop impact on a liquid layer, drop rupture in a Couette flowfield, wetting-angle formation for a drop on a solid surface, development of Rayleigh-Taylor and Kelvin-Helmholz instability on a gas-liquid surface. The problem of mathematical modeling of flows of three-phase three-component mixtures with phase transitions has been investigated using density-functional theory. The analytical and numerical results demonstrating the efficient application of this approach to description of two-phase flows were obtained earlier. In the present work, methods extending the density-functional technique to the case of three-phase mixtures have been proposed. Numerical solutions for flows of three-phase mixtures, including those with phase transitions, have been given. The density functional method is used in nonrelativistic hydrodynamics for a description of multicomponent multiphase mixtures. The method is based on an expression for the entropy in the form of a functional with terms quadratic in gradients of component densities. 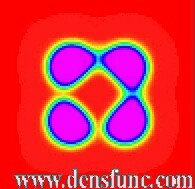 In the present work, the density functional theory is generalized to the relativistic case. This generalization involves a solution of a number of problems: relativistically covariant formulation of the theory equations, derivation of basic relationships with allowance for the generalized relativistic principle of entropy production, and check of the relativistic causality of the theory. It is demonstrated that higher-order derivatives in the theory appear to be compatible with the causality in the basic relationships nonlocal in space and time. O.Yu. Dinariev, N.V. Evseev, Modeling of Surface Phenomena in the Presence of Surface-Active Agents on the Basis of the Density-Functional Theory. // Fluid Dynamics, 2010, Vol. 45, No. 1, pp. 85-95. Within the framework of the density-functionalmethod in multiphase multicomponent mixture hydrodynamics, the possibility of modeling surface-active agents on a"fluid-fluid" phase interface is shown. The method is based on the continuum description of multiphase mixtures with introducing terms quadratic in component density gradients to entropy or free energy. The determining equations are derived. Hydrodynamic model problems which demonstrate certain typical phenomena (the accumulation of surface-active agents on the phase interface, the corresponding decrease in surface tension, and the Gibbs and Marangoni effects) are solved numerically. A. Demianov, O. Dinariev, N. Evseev, Density functional modeling in multiphase compositional hydrodynamics // Can. J. Chem. Eng., V.89, April 2011, pp.206-226. This work is essentially a review of a density functional approach in multiphase hydrodynamics developed by the authors during the last 15 years [Dinariev, J Appl Math Mech 1995;59(5):745�752; Dinariev, J Appl Math Mech 1998;62(3):397�405; Demyanov and Dinariev, Fluid Dynam 2004;39(6):933�944; Demianov et al., �Basics of the Density Functional Theory in Hydrodynamics,� Fizmatlit, Moscow; 2009 (in Russian); Dinariev and Evseev, Fluid Dynam 2010;45(1):85�95]. The basic assumption is a representation of the entropy or the Helmholtz energy of the mixture as a functional that is dependent upon chemical component densities. The hydrodynamic system of equations (local conservation laws for chemical components, momentum, and energy) is used to describe multiphase processes, and the constitutive relations (expressions for stresses, diffusion, and heat fluxes) are derived from entropy growth requirement. The authors present the results of numerical simulations describing static and dynamic multiphase systems. And some over, please, see later.